Williamson Allemond Regional Eye Center - Baron J. Williamson, M.D. Dr. Baron J. Williamson, a native of Baton Rouge, is a graduate of LSU Medical School. He completed his residency in Ophthalmology at the University of Alabama in Birmingham. Dr. Williamson is a Board Certified Ophthalmologist specializing in Cataract Surgery. Dr. Williamson has performed thousands of Cataract Surgeries specializing in the “Advanced Technology Lenses”. He is well known for his management of Eye Disease, including Glaucoma and Diabetic Retinopathy. 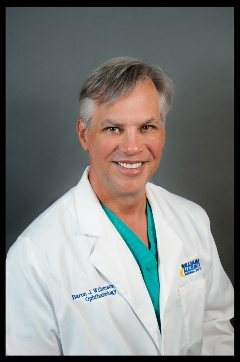 Dr. Williamson has written numerous articles, lectured extensively and served as a medical consultant for the laser industry, training physicians from around the world in state-of-the-art laser techniques.